PARIS -- Resplendent in yellow and riding a canary yellow bike, Chris Froome has won his second Tour de France in three years, with a leisurely pedal into Paris to wrap up a spectacular three-week slog of furious racing that culminated with a thrilling late fight-back by the British rider's toughest rival, Colombian Nairo Quintana. Cheered on the Champs-Elysees under suitably rainy skies for Britain's third win in the 112-year-old race, Froome took it easy on the last Stage 21, his work done having grimly resisted Quintana's last-ditch assault on his hard-won Tour lead on Saturday on the final Alpine ascent. Just as when Froome first won in 2013, Quintana is again runner-up, although the margin is much smaller this time. Froome and his teammates crossed the finish line together in a line, arms across each other's shoulders, with Froome grinning in the middle. 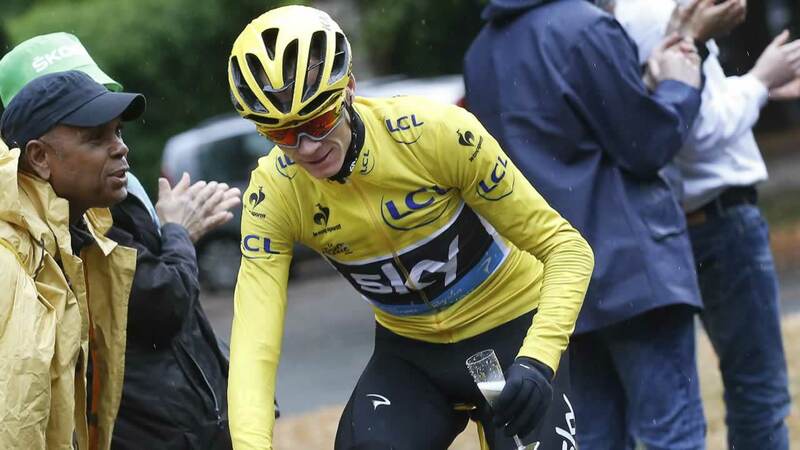 Because of rain and slippery roads, Tour de France organizers have stopped the race clock, meaning Chris Froome is guaranteed his second victory just so long as he crosses the finishing line. Normally, riders' times would have been taken at the finish line after 10 loops up and down the Champs-Elysees avenue in Paris. But to minimize the risk of crashes on the slick cobblestones, race organizers have decided to stop the clock at the beginning of the first loop. That locks in Froome's race lead over runner-up Nairo Quintana. The British rider must still ride the 10 laps to complete the full Tour distance. But he can now do so at his own pace, without the risk of crashing, leaving sprinters and their teams to ride off in search of the stage win. The riders' rain gear is out and Chris Froome is hoping for a mostly relaxed cruise to Paris, as the Briton sets off with the pack toward his second Tour de France victory. Wearing the leader's yellow jersey, Froome and other Tour stars posed for photos as Sunday's 21st and final stage got under way leisurely from the western suburb of Sevres to Paris' Champs-Elysees. The pace of the race was expected to crescendo as the pack nears the famed Paris boulevard, where the day's main contest was an expected sprint finish. The 30-year-old Briton who won in 2013 has a lead of 1 minute, 12 seconds over second-place Nairo Quintana. That's all but impossible to overcome over the flat and relatively short 109-kilometer (68-mile) stage. Despite crashes and a "hectic" atmosphere, Anna van der Breggen made it two straight Dutch victories in La Course by Le Tour de France women's race on the Champs-Elysees, held on the same day as the Tour de France finishes. The 25-year-old rider, who also won the Giro Rosa stage race in Italy this month, broke away on the rain-splattered Paris boulevard to beat Jolien D'hoore of Belgium, who was second, and Dutchwoman Amy Pieters in third - each 1 second behind. "It was a really slippery road, it was hectic all day," said Van Der Breggen on French TV. "This race is really, really big for us." Marion Vos won the race's debut edition last year.